NEW YORK (CNN) -- Boeing will slash about 1,000 jobs from its Integrated Defense Systems department because of funding cuts by the Pentagon, according to a memo to employees. These cuts are in addition to previously announced job cuts at the aerospace giant. 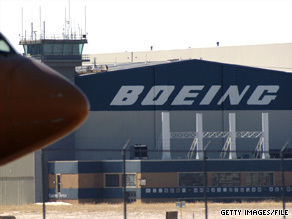 Boeing has announced additional expected job cuts that will total around 1,000 positions. The Boeing news, coupled with job cut announcements Tuesday at NASA and US Airways, is a stark reminder of the continued precarious position of the U.S. worker in a severe recession that won't loosen its grip. The 1,000 job cuts at Boeing will happen at several Integrated Defense Systems sites across the nation, and affected employees will be notified beginning this week, according to Jim Albaugh, head of IDS. "In recent weeks, customers have directed us to stop work or reduce the level of effort on some specific programs, requiring us to take immediate steps to reduce employment," Albaugh said. The cuts are tied to the Ground-based Midcourse Defense program and the Army's Future Combat Systems program, the memo said. The Midcourse Defense is a missile system meant to defend the United States against ballistic missile attacks by terrorists or rogue states, according to Boeing's Web site. The memo also aimed to assure workers that progress was being made in acquiring new government and international contracts. The Defense Department was not available for comment. In January, the aerospace company and defense contractor announced that it would cut a total of 10,000 jobs this year as it struggles with slumping demand.